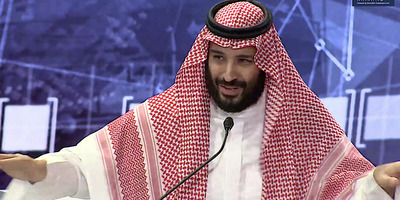 Sky News; Future Investment InitiativeSaudi Crown Prince Mohammed has claimed unity with Turkey when discussing Jamal Khashoggi’s death. Saudi Crown Prince openly spoke about Jamal Khashoggi on Wednesday for the first time since Saudi Arabia admitted to the journalist’s death. He claimed unity with Turkey, despite a series of leaks from Turkish officials implicating him personally in the killing. He was speaking at the Future Investment Intuitive in Riyadh, a major economic conference which many businessmen and politicians abandoned as the Khashoggi crisis blew up. Saudi Arabia’s crown prince has talked up his unity with Turkey amid the crisis over the death of Jamal Khashoggi, despite a series of leaks from Turkish officials implicating him in the killing. Speaking at a major investment summit in Riyadh on Wednesday, Crown Prince Mohammed bin Salman attacked unnamed critics trying to “drive a wedge” between his country and Turkey, where Khashoggi was killed. Khashoggi died inside the Saudi consulate in Istanbul on October 2. Saudi Arabia claimed it was the result of a fistfight gone wrong during a rogue operation, and have been at pains to distance Crown Prince Mohammed from what happened. Hamad I Mohammed/Reuters; Middle East Monitor via Reuters; Matt Dunham – WPA Pool/Getty ImagesA composite image of Saudi Crown Prince Mohammed bin Salman, Saudi critic and journalist Jamal Khashoggi, and Turkish President Recep Tayyip Erdogan. 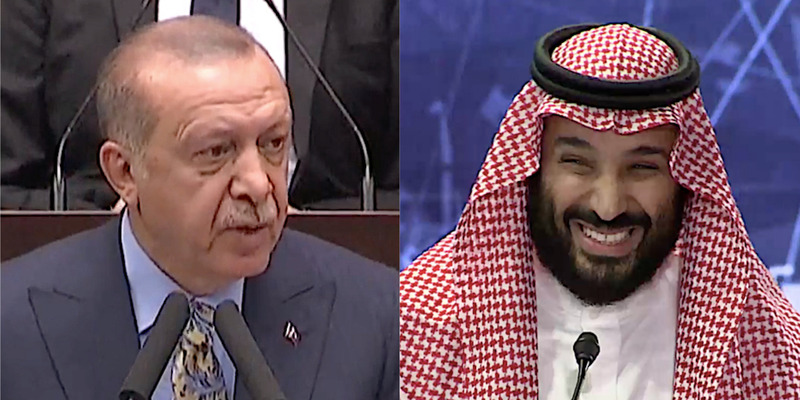 It’s not clear who the crown prince accused of driving the so-called “wedge.” Most of the least helpful remarks have originated in Turkey, albeit with nameless officials briefing domestic and US media. The leaks have undermined Saudi attempts to claimed that Crown Prince Mohammed had nothing to do with the killing, a story many experts have found dubious. Earlier this week Reuters cited Turkish intelligence sources as saying that Khashoggi’s death was coordinated via Skype by one of Crown Prince Mohammed’s own henchmen. 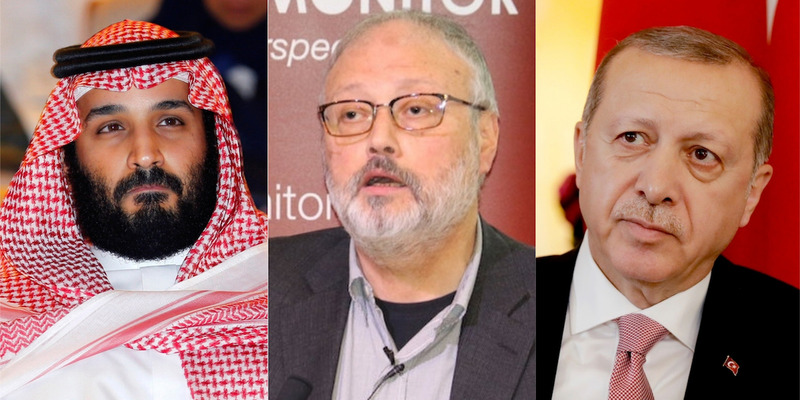 Many members of the 15-man hit squad, whom Turkish media identified as the suspects behind Khashoggi’s disappearance and death, have also been seen in the crown prince’s personal entourage. Future Investment InitiativeSaudi Crown Prince Mohammed bin Salman speaking at Saudi Arabia’s Future Investment Initiative in Riyadh on October 24. “This wedge will not happen, and we will prove to the world that the two governments are cooperating to see that all perpetrators are taken to court, and justice will be seen at the end,” Crown Prince Mohammed said. Erdogan on Tuesday said that he had spoken to Saudi King Salman on the phone about potentially sharing intelligence on Khashoggi’s death, suggesting that he was not yet ready to assign personal responsibility to the Saudi monarchy. The Turkish president, however, did not mention Crown Prince Mohammed at all. Turkey has challenged the Saudi narrative of Khashoggi’s death at every twist and turn with explosive intelligence leaks. Experts say this could be because Ankara is trying to extract some kind of concession from Riyadh, which could come in the form of new contracts or an informal payment. Many businesses and politicians distanced themselves from Saudi Arabia, a major arms importer, over Khashoggi’s death. US Treasury Secretary Steve Mnuchin, The New York Times, and AOL co-founder Steve Case all pulled out of this week’s Future Investment Initiative.